We can control the speed of a DC motor through a microcontroller. All we need to know about PWM .That means " Pulse Width Modulation ". It is a very popular technique and most important part of a microcontroller. In this tutorial we will use PWM to create signal. By changing pulse width of a signal ,we can control the speed . 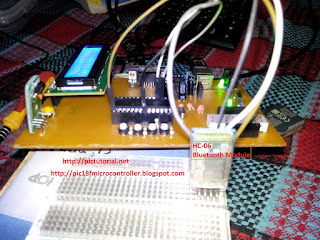 At first we will connect a DC motor with PIC microcontroller and we will also connect two push buttons with it. One of those buttons will be used for increasing speed and another one for decreasing speed. That's all . 1. Increasing duty or Pulse Width will increase the speed of DC motor . 2.Decreasing duty or Pulse Width will decreasing the speed of DC motor. Pic microcontroller's has two PWM or CPP module look at the picture . In L293D's EN1 pin we provide the signal. If you will provide highest pulse width, the speed will be highest. When you will decrease pulse width, the speed will also be decreased. Time Period = Times of ON state + Times of OFF state . 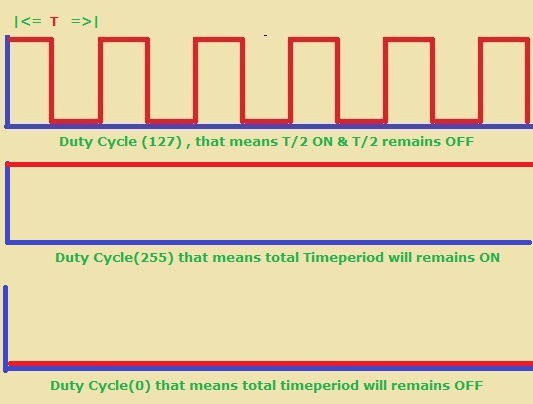 Here most important thing is PWM1_Set_Duty(count) , If we increase the value of count, the speed increases. If we decrease the value of count, the speed decreases. Another important thing is the highest value of count is 255 and lowest is 0. So, count = K * PW ----eq(1) where K = constant . Finally we get, count =255*(PW/T), This is the relation between count, PW & T.
That was not very necessary for this tutorial. But I've shared all I knew. Hello Mr. I need CCS code for this pwm control.... is it possible give me changed it? Thank you.